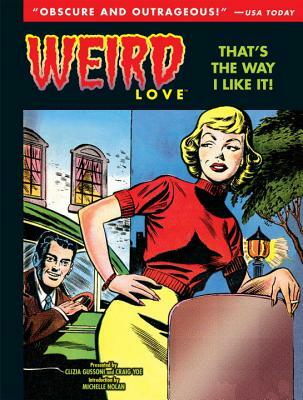 Michelle Nolan, writer of the groundbreaking book "Love on the Racks: A History of American Romance Comics," provides a fascinating introduction to "Weird Love: That’s The Way I Like It!," the second sleazy and stupefying volume in the series that "Wired" magazine calls "deranged genius!" You’ll love, you’ll hate these lurid stories: "Too Fat to Frug," "Men You Shouldn’t Marry," "Leader of the Pack," "Love Slaves," "Stay Away From Married Men," "Trailer Park Girl: Flirtation on Wheels," "Mail-Order Marriage," "Thrill Crazy!," and other classics of Good Girl Art! There are first-person pulp confessionals like "I Was a Border Racket Girl," "I Was Too Beautiful," "I Was a Waterfront Girl," "I Was a Child Bride," "I Married a Monster," and much more cringe-worthy, laugh-riot comic book kitsch! Vice magazine has called Craig Yoe the "Indiana Jones of comics historians." Publishers Weekly says he's the "archivist of the ridiculous and the sublime" and calls his work "brilliant." The Onion calls him "the celebrated designer," The Library Journal, "a comics guru." BoingBoing hails him "a fine cartoonist and a comic book historian of the first water." Yoe was Creative Director/Vice President/General Manager of Jim Henson's Muppets, and a Creative Director at Nickelodeon and Disney. Craig has won an Eisner Award and the Gold Medal from the Society of Illustrators.